The Daubenton’s Bat is a specialised Bat always found over waterways. It is not a scarce or an endangered species. This study is aimed at investigating its relationship with water. At the time of writing (November 2012) Lough Allen has proceeded shockingly fast into a phase of deteriorating water quality. For the present this pollution may only be unsightly, though it has killed some of these Bat’s mammalian cousins — Dogs! An on-going Study into one of the rare Species in Lough Allen’s Natural Biodiversity. In preparation for the Survey Season in August we have updated some statistics from our work over the past 11 years. These are presented below. Daubenton’s, or the Water Bat, is surveyed every year during August with 1 survey at the start of the month and a second one in the latter half. Unlike many species Daubenton’s fly in a regular pattern over rivers and lakes and typically about 30 cms. over the water. If you would be interested in participating in this sort of work do CONTACT Bat Conservation Ireland. They would love to hear from you! Will 2016 be a record year for Daubentons? Overall, looking at the graphic on the Right, there has been a slight decline in numbers with 2006 (our first year) yielding the best totals. In fact it sometimes doesn’t feel like there has been an overall drop and if we have a bad survey it often seems attributable to the weather —being unkind either to the Bats or the observers! Some of our best site counts have been in recent years, as can be seen from the lower graph. For the first 3 survey years only a few Site counts exceeded 50 individuals per count; in the latter years there is a greater percentage of 50+ counts. Two surveys and 10 sites are combined to give the numbers shown in each yearly column. BELOW: List of Numbers recorded at each site for every visit over past 10 years. These are our interpretations. We include both visual and Bat Detector ‘sightings’ where we are sure these are Daubenton bats. First Survey of 2008 was not possible due to weather. These are a small to medium sized bat but with a striking long and pointed wing which they use to great effect to cover a large area of water. Brown on top and white underneath, they are very characteristic when caught in the torch light. Neither are they shy. We have often been sitting with our feet in the water only to see these animals flying around very close to our legs. It is a very rewarding experience of nature. Long may they survive at Lough Allen! Sourced from WikiMedia Commons. Ownership not clear. Whilst easy to observe and to count these bats are enormously hard to photograph. Many pictures you see show the species at roost in a tree or stonework. 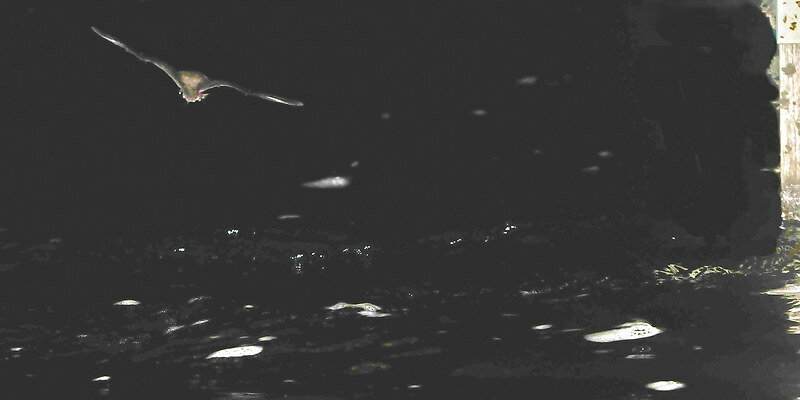 We love pictures of these Bats skimming precisely and at an even height over the water, as shown in some of our pictures below. Typically, this is what they do and, whereas other bats may feed over water, none cruise up and down at the same fixed height occasionally dropping to pick up a tasty morsel from the water. We have sought to acquire other people’s photographs but it is very difficult and time consuming to get Copyright. However, some very good Websites allow us to link to their work and you may see some stunning pictures of Daubenton’s Bats in ARKive. The link below to Bat Conservation Ireland’s Pilot Report is a very comprehensive review of Daubenton’s Bat biology and status in Ireland. BCI Daubenton’s Monitoring Pilot with superb review of known facts. See how you can do Monitoring for Bat Conservation Ireland. It is a widely dispersed species found in most of Europe, save for the far north, and stretching through Asia to Japan. Widespread and locally abundant in Ireland — and we are delighted to claim that the Survey Area (shown below) is probably one of the most productive in the country. In our first year, and most successful to date (2006) c. 650 records were made over the 10 stations and 2 surveying nights! A useful national distribution map is found on the National Parks and Wildlife Service Irish Wildlife Manual No. 61. Lough Allen Daubenton’s Bat Survey. This is not our project. It is organised by Bat Conservation Ireland and we are very pleased to be allowed play a part in it. Bat Conservation Ireland organises hundreds of counts throughout Ireland. They are repeated year after year in exactly the same locations, often by the same people. Undertaking routine counts of a species (biometrics) is a standard procedure used in assessing how well an individual animal or plant is doing in a particular Country or area. We do not know yet whether these Bats are safe and secure in their Irish environment. One would have an inclination to think that they will suffer if pollution, and the surprisingly poor state of our waters, is not rectified quickly. However, there are some interesting comments on this issue below. It is amazing also to note how natural conditions have changed over the short period we have been undertaking this monitoring. We have seen the onset of many years of late Summer rains resulting in higher water levels both in Lough Allen and, often, in the Shannon River coming out of Lough Allen. The site is a 1 km stretch of the Shannon River in the South West corner of Lough Allen from where it leaves the lake to where it passes under the R280, Drumshanbo - Drumkeeran Rd. It is a wide stretch of normally calm river with a few short areas of agitated water or rapids near Sites 1, 7 and 10. The width is considerable but very consistent. Bats at the far side of the river can normally be both seen and heard unless there is some fallen tree in the way. There are many small and some larger trees along both banks — particularly between sites 5/15 and 8/18. Surveys every year were done from the southern (Leitrim) side of the river, but since 2013 are now done on the other side of the river due a ‘jungle’ of Willow Herb and Brambles blocking the path between sites 3 and 4. As we are scanning directly across the river the area of water surveyed from both stations is similar. Numbers 11 - 20 are now logged as Sites 1 -10. Sites are covered on two separate visits at the beginning and end of August. Consistent sampling is required to achieve comparable results. Weather conditions are recorded and the main change over the years seems to have been in the frequency of heavy Summer rainfall — leading to the abandonment of Survey 08a because of the absence of a suitable survey night during the first half of August 2008! 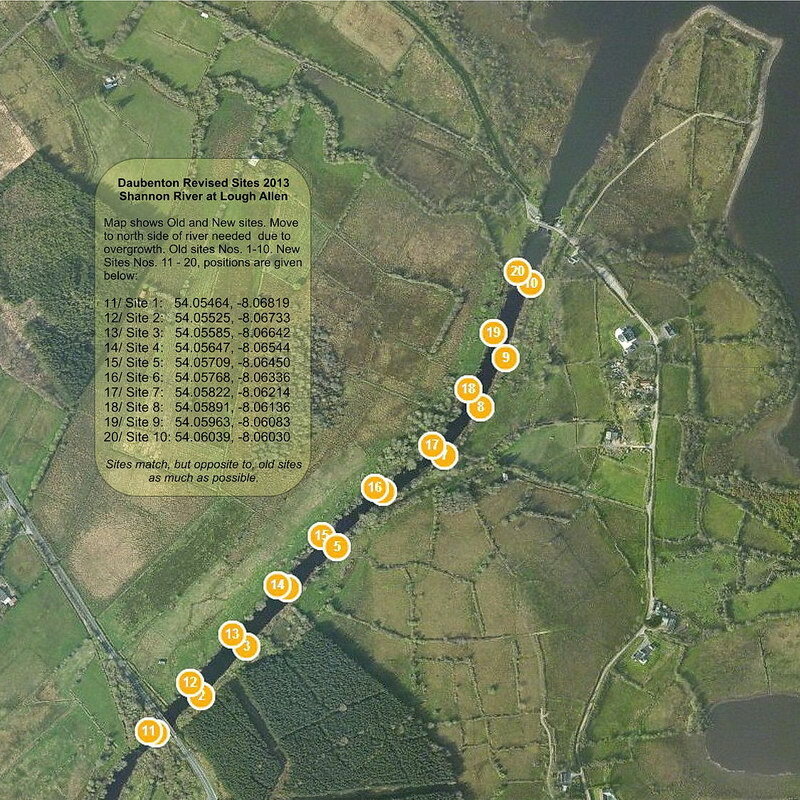 Numbers are good on this stretch of the River Shannon at Lough Allen. It is an ideal habitat for them with a large and wide, gently flowing deep river, bordered by many large trees and with bridges and sluices and other old buildings for possible breeding and hibernation. In most years more than 400 records (audio and visual) are made in a combined period of about 3 hrs. over 2 nights This may not be 400 Bats as repeated transits are inevitably recorded. Largely insect feeders, Daubenton’s Bats seem to specialise on Chironomids (Midges), other Diptera, and Trichoptera — sometimes picking these up off the surface of the water. Much detail on food and foraging is given in the Bristol University Study linked below. We cannot believe we have been doing these surveys for 7 years. We have only briefly reported on this work before. This is for two reasons. Firstly, the work has been undertaken as part of Bat Conservation Ireland’s ‘All Ireland Daubenton’s Bat Waterway Survey’ and we were happy to do this work before LoughAllenBasin.com was started. Secondly, it has been hard to present images and natural history of this species being, as it is, almost impossible to photograph! But it is a very attractive species and one little known to the general public. It feeds specifically over water — hence its German name ‘Water Bat’. Surveying and recording populations of these Bats is carried out throughout the island of Ireland. The stretch of water it has been our pleasure to survey for the past 7 years is shown in the Map on the right. Bats are recorded at 10 stations approximately 100 metres apart. Both visual sightings and detections using a Bat Detector are recorded as the bats either fly up and down past the observation point or, quite frequently, fly around in a gentle curve in front of the observation point. Typically these Bats will always fly at a constant height of about 20 - 30 cm. above the water and follow a steady course either in a straight line or gently curved. This flight pattern, their white bellies, and the very characteristic pattern and frequency of their echolocation make this bat easy to identify. The Diagrams representing the status of Daubenton’s Bats 2006- 2016 has now been updated and moved to the top of the page. Some worries exist that numbers could be dropping. But it must be remembered that this is a Palaearctic species occurring over a huge range, and it has been seen to be expanding in Europe. Certainly, from an observers point of view, weather conditions seem to have changed in the past decade and it is a possible that changes in numbers simply reflect changes in ability to observe as well as fewer bats flying on a particular night? However, bearing in mind so many impinging factors, any change can be described as fairly minimal and, given two good nights in August 2016, we may well see levels back up to 2006 levels! There is no on-going work on the watercourse and pollution level in Lough Allen is no worse (and maybe better) than in recent years. Table 14 D/1 below shows snippets of data from a survey done in Spring 2014. This is a time of the year when we have never surveyed Daubenton’s Bats before. It springs from further research from Great Britain on the issue of two bats flying right behind one another. This is a phenomenon we have noticed in the Summer surveys over recent years and the only logical interpretation is that it is a mother and child paring with young Daubenton’s regularly on the wing in late August. No ‘By-Twos’ were seen in 2013. This is puzzling as 2013 was a very good year at Lough Allen for Daubentons — possibly they just started breeding later than usual? Our correspondent from Britain has informed us that he is getting 100% pairing of closely associated bats in work being done in April 2014 following a resumption of feeding by Bats in his survey area. He also supports the view that this could be emergent (now pregnant) females with last years young still in tow. Our results yielded lower percentages ranging from 6 - 12% occurrence of ‘twosomes’ to single bats feeding at Sites 8 - 10 of our survey area... But it was good to see so many Daubentons feeding at a time when they are starting to breed. We believe there is not enough evidence in this data to justify pessimism. This is a species that is successful, is not under threat, and (with a little care) should continue to weave its magic over our Summer rivers and lakes. As active carnivores, numbers will drop if prey is removed or made harder to obtain. Many animals will abandon breeding attempts in unsuitable conditions and simply wait until the following year. Prey species, especially freshwater Diptera, may become scarcer or harder to catch for many reasons. e.g flooding, pesticides, adverse weather, changing water quality, etc. There is an intriguing suggestion that slight enrichment of the water (aka ‘pollution’) can increase prey such as chironomid midges and thereby benefit the Bats. (This is discussed further below.) We await next year’s weather and Bat numbers to see if the double dip decline shown above is extended or reversed? Site 1 and Site 10 (see Map) both have short areas of rapids. Rapids disrupt echolocation so Daubentons tend to avoid them. At Site 10 the rapid (from the sluice) is almost finished before the monitoring point. Also, the river is very wide here. The rest of the sites are either very calm or slow flowing, and similar apart from amount of tree cover. Site 10 has very often been our best Site — quite exciting in fact, with up to 100 Bats being seen over 4 minutes. We assume that this is due to rich feeding in this area or the presence nearby of a suitable location for a Summer (breeding) roost. There was a marked decline in records from this Site in 2011b (ongoing work on sluices) and 2008 (bad weather?). Generally low numbers have been found from sites 2 and 3 (exposed areas?). We WANT OTHER PEOPLE’S HELP in confirming our view that these are mother and offspring! 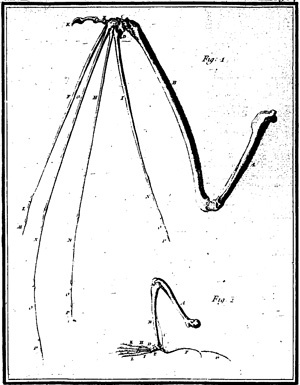 This specifies two Daubenton’s Bats travelling so close together as to be inseparable by sound and which only became apparent as a twosome when they entered the torch light. Every year ‘By-Twos’ were frequent and, and as far as we can recall, present in both annual surveys. This year (2012) there were none in the first count and 6 pairs in the later survey. The first count this year was done on the 3rd. August, the same date as 2011. By-Twos were present that year but we have no record of the number. This prompted us to consider what was the relationship between these two bats and why had the numbers of ‘By-Twos’ reduced this year. Initially we assumed that they were mother and child — Daubentons only produce one offspring each year. Please note that the 2 images Below are compositions using 1 or 2 images taken separately. Site 10. Our most populous site for most of the decade. This is 100m. below The Sluices. Water is still agitated but Daubenton’s feed here in huge numbers. Here a pair are ‘shown’ flying fast and turning as they pass a Water Gauge. Very similar position but Bats are flying straight and level. In this mode the rear Bat can be travelling at a considerable speed and extremely close. They are the Red Arrows of the bat world! We think the rear bat is the ‘child’ of the one in front. The youngster will stay right behind the mother and follow her every twist and turn. N.B. Each image is made up of two photos. Firstly the leading bat and the background. Then a second image of another bat is imposed on the image in a position and an attitude that reflects our visual observations as accurately as possible. After our surveys were completed, we experimented with trying to photograph some of the behaviour of these Bats. You will see a few of our pictures on this page; not as good or as numerous as we would wish. Trying to photograph two Daubentons in close pursuit proved even more difficult. So we have made an effort to reproduce what we saw graphically in the images above. These are based on various photographs, cloning the images, and placing the Bat partners roughly in the position we remember them visually. This year with significant increased contamination of Lough Allen and the Shannon, and in previous years with high water levels, we have often wondered how ‘our’ bats were faring. The graphs presented above start to show a pattern of declines over 3 or 4 years followed by an upsurge. This reflects a typical predator/prey relationship but there is no reason to believe that the prey species of Daubenton’s Bats may be in short supply at Lough Allen. Unfortunately, we had not previously considered these Daubenton ‘By-Twos’ as an indicator of breeding success. We have noticed this behaviour over many years and have regularly called it but, unfortunately, our records to date simply added another two bats without any observation that they were flying in consort. (Yeah, we know. Stupid, eh!) Now we believe that this is proof that these lead bats are female and that they have bred successfully! The ratio of Daubenton’s Bats flying in pairs to those flying on their own should be able to provide an indication of the breeding success of that population for that year. Of course, there are complications! Firstly, when do the young start to fly? Would they all appear at the same time or is gestation and birth in Daubenton’s very variable? How long would the young be dependent on their mothers? Initially we will consider that, at a period around the first half of September, all surviving young Daubenton’s Bats were on the wing. And we do have this years records of pairs versus individuals to go on! Unfortunately, for the majority of individual Bat-passes we recorded there is no way of telling which were male and which were female. Nor can we assume that they were all female. But there may be a constant relationship between the numbers of males and females present on this stretch of the Shannon, or there may not? Males do not take part in rearing the young and may be off in a swarm elsewhere on the Lake. Traditionally, these By-Twos have been stuck together like glue and following the typical foraging pattern. Hence the ‘are these a mother and son/daughter pairing’ idea. Was this part of the growing up experience for young Daubenton’s at the end of August? We have searched the literature and the Internet for photographs of this behaviour. All to no avail. In the peak years of 2006 and 2010 we have a folk memory of calling ‘By-Two’ repeatedly at many sites but especially at Site 10. They could have made up to 10% of the calls. This would equate to 10 passes of Bat pairs on counts 2006b and 2010b at Site 10, or ten Young, ten Females and 78 other Bats. But we cannot confirm this. Also ‘By-Twos’ occurred at other sites as well. If our memory serves us well a ratio in a good year would have been 10:88 Young to Adults or 1:4½ Young to Females — if the sexes were evenly divided? (That is a big ‘if’.) The figure for 2012b would be 1:16 (Y:F). However this is just an exercise — there is clearly not enough data to work on. We will be studying this phenomenon further in years to come. We took the photographs, and we do regret their poor quality, on the 12th. and 21st. of September at Site 10 of our survey area. We were not counting numbers during these visits but it was apparent that the number of ‘orderly’ By-Twos had diminished and a new behaviour was coming to the fore. On both these visits several pairs of Bats together were still seen and, for much of the time, acting in the normal pattern of steady low level flight in close pursuit of one another. But there was a new and unusual dance taking place. Every so often the lead Bat would suddenly give up the low and steady flight and climb up 2 or 3 metres towards the leaves of overhead trees — the sort of behaviour we have never seen in Daubentons before. The second bat would follow accordingly. They were not seen to try and obtain food in the air or off the leaves, but this is a possible explanation. Could they have been hungry and trying new methods in response to poor weather or water quality? Or perhaps the Mother was trying to get rid of an over-possessive young? Daubenton’s Bats mate at this time of year and the Summer roosts, which are mainly for mothers and young, would be breaking up? We have discussed this with the experts and, maybe, we will be able to add more here when they have had time to review our comments. It would be very interesting to know what is going on. Again we have seen little reference to this behaviour, not to mention any photographs! Many thanks in particular to Bat Conservation Ireland for all the information in their Files and Publications. Also to many other authors of papers from around the world. In particular we would acknowledge specific data on certain aspects of breeding from The Ecology of Bat Reproduction. Sophie Bradley, Nottingham. A Summary of the strange and interesting reproductive life of Daubenton’s Bats. Males are very promiscuous and will mate over a long period. Females delay the fertilsation for a period after mating. Sperm stored since Autumn is used to fertilise an egg. Ovulation follows resumed feeding after hibernation ends. Length of pregnancy is reported in detailed studies listed below. 1 baby bat is born to each pregnant female. Entirely dependent on milk from their mothers. Learning to fly and feed themselves. They fly 3 weeks after birth. Daubenton’s are quite long lived animals. Youngs Bats are sexually mature after 1 year. In trees, buildings, bridges, etc. Occupied by 20 - 50 bats from early Spring to late Summer, largely females and their young. Hibernation roosts, where bats seek a steady low temperature and go into a deep sleep, or torpor. Daubenton’s Bats have many partners and show little courtship but mating seems extended over quite a long period even including hibernation. Changing Water quality and the Bats? 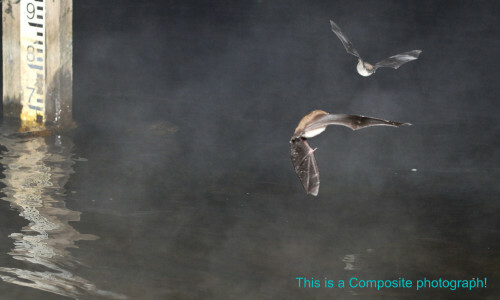 The photograph below was taken on one of the nights we were trying to record the behaviour of the Daubenton’s Bats. At that time (12th September) large amounts of foam were coming through the sluices and remaining intact as the large ‘blobs’ you can see in this photograph. One of our aims in preparing this Study has been to see if Daubenton’s Bats can be a species that may prove a valuable indicator in our continuous search for Biological factors demonstrating an increasing level of pollution in Lough Allen in the past 5 years — and the means to control it? When we arrived in Leitrim in 2001 we used to swim in Lough Allen along with our dogs. The water was lovely then and we used to have some ‘Summers’. From about 2006 onwards we have been intensely involved in surveying and recording the biodiversity of Lough Allen — that is what this website is all about. In 2011 we first reported our concerns to Leitrim County Council and they referred us to the Environment Protection Agency. We have liaised with the EPA and continue this work to date. We assume a major part of this contamination is phosphate which will trigger Cyanophyceae (‘blue-green algae’) to bloom at a very low level. We have sought to measure this in rivers and streams and have normally got a zero — as could be expected with such dilution. However, we are starting to get readings up to, or over, permissable levels in streams leading from a housing estate or other local treatment plants. We think that physical methods of monitoring the water are proving insufficient and visual observations of foam and blooms and changes in water quality (as seen in the photograph) do, in fact, confirm that Lough Allen is becoming clearly and seriously polluted in recent years. 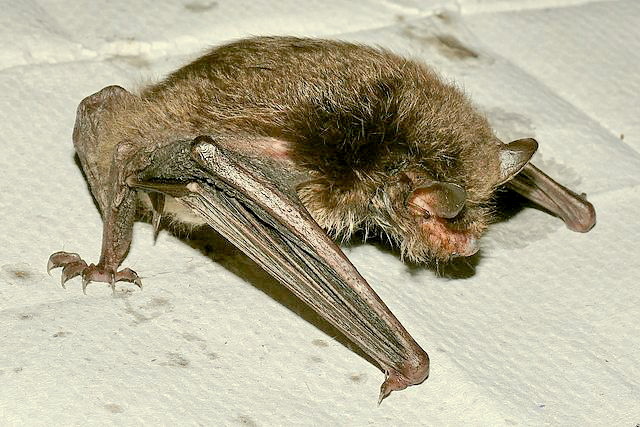 Some literature does suggest that contamination of their water habitat will automatically cause a decline in the populations of Daubenton’s Bats. Other reports we see have suggested that increasing the trophic level of a water body may provide favourable conditions for Chironomid midges to flourish — we have all noticed apparently higher levels of midges in recent Summers — and this would in turn help the Bat population! 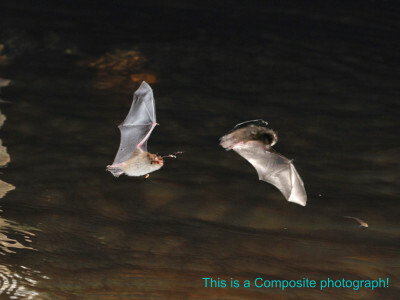 It is possible that large amount of contamination on the water surface could affect Daubenton’s Bats in several ways. 1. Direct poisoning or making bats sick simply from ingesting foam along with prey. Daubenton’s do pick up food items from the surface of the water. 2. Impeding foraging efficiency through interfering with catching prey. It is known that areas of rapids do interfere with these bats echolocation system and they tend to avoid such areas — probably the reason why Site 1 is often a poor site for us. 4. Bats may not breed in adverse conditions. Distribution of Foam in bat survey area. We were shocked by the water quality on both of our survey visits to our Daubenton patch this Summer (2012). At Site No 10. up near The Sluices, on both occasions (and on two subsequent photographic visits), large lumps of foam were moving quickly down stream — very much as shown in the picture. The source of these, we believe, is synthetic. Our survey area rapidly calms down as we move downstream and by Site 6 areas of foam were much less conspicuous. We found it disturbing to be witnessing some small white blobs busily hunting over water covered in other more sinister white blobs! Although the presence of pollution has been becoming increasingly visible in Lough Allen for many years, this is the first year it was so clearly visible when we were undertaking our bat surveys. It is not possible to prove that this situation is having any impact on the Daubenton’s Bat population. We are going through a period of declining bat numbers but we have seen this before (in 2008) when significant pollution was definitely not such a serious worry. No Technical Monitoring will be able to prove a level of concentration in open water such as this. The Bats, and other biological sensitive species, may well prove to be the best indicator of water quality change in our delicate environment. “The Environmental Protection Agency (EPA) has identified eutrophication (over-enrichment with nutrients) as the main threat to water quality in Ireland. In most cases the nutrient of importance is phosphorus. We are impressed with this analysis and support its goals. 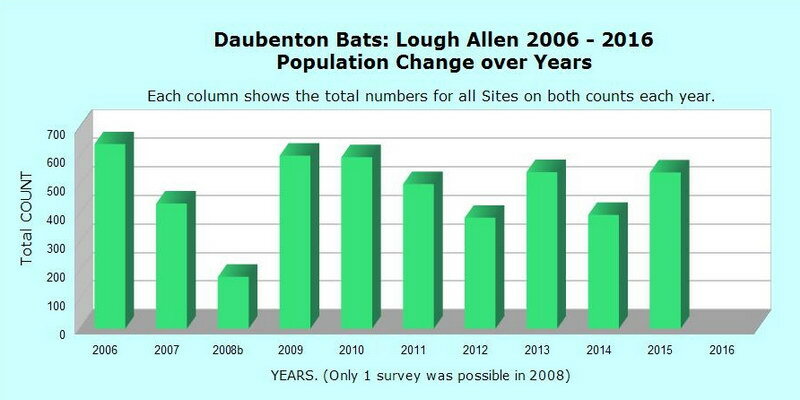 Our recent study on the Daubenton’s Bats has again highlighted for us just how polluted Lough Allen has become in recent years. We have recently seen levels of Phosphate (not Phosphorus) in small streams and ditches that match the EPA standards for maximum tolerable level. This phosphate is derived from treatment plants and typically they would be new installations — hence the recent upsurge in visible signs of eutrophication in the lake. But the EPA’s authority must be respected and we all must work together positively to control and eliminate this blight on our countryside. There is much individuals can do to reduce the phosphate burden on our waste water systems; there is much everyone can do to reduce the discharge of phosphate from sewage treatment systems. A clean healthy environment can be achieved again, if we undo some of the mistakes of recent years. Love this picture available from WikiMedia Commons, the site distributing images that are in the Public Domain. This thoughtful friendly Frenchman, with such elegant style, is Louis-Jean-Marie Daubenton as portrayed by Alexander Roslin. Don’t you just love his attire! 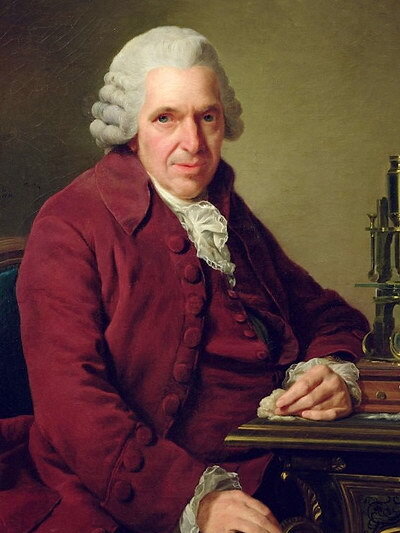 Daubenton spanned most of the 18th Century with interests in Theology, Medicine and Natural History. He undertook a large collection of dissections and drawings of 182 species of Quadrupeds including, we guess, bats. These were some of the earliest detailed examinations of Mammallian anatomy. It is fascinating to relate names of Plants and Animals to the people that they are called after. As well as Daubenton’s Bats, here in Lough Allen we have the Irish Lady’s Tresses, Spiranthes romanzoffiana, where Romanzoff was the Governor of Kamchatka in the time of Czarist Russia, who sent Botanists into Alaska to discover this Orchid — not found in Europe or Asia apart from Ireland and Scotland! Other sources we have used in Researching this article. Information on Echolocation, Life History, Feeding, etc. Overview of Reproduction in Bat spp. Technical insight into anatomy, breeding, ecology, fossil record, etc. Study of behaviour, roosting, tagging and virus infection. Clear and specific details on all areas of Biology and Ecology.